The bag that watches your back. 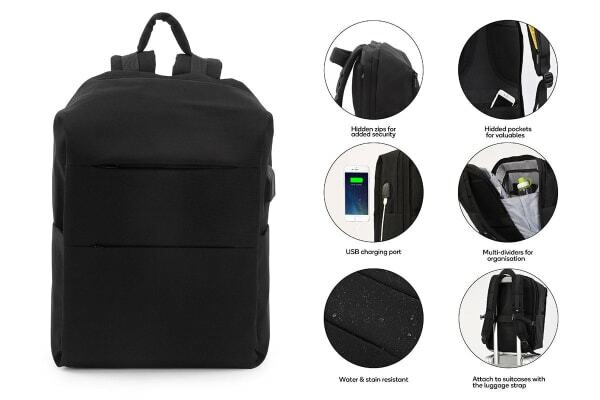 The Ultimate Anti-Theft Defender Backpack helps protect your possessions from both pickpockets and damage by the elements. Concealed zippers so thieves can’t find your valuables! Are you safe from pickpockets? Avoid ruined holidays and catastrophic commutes with the help of the Ultimate Anti-Theft Defender Backpack with USB Port. With hidden zippers and concealed pockets, it’s pretty much impossible for thieves and opportunists to access your valuables. 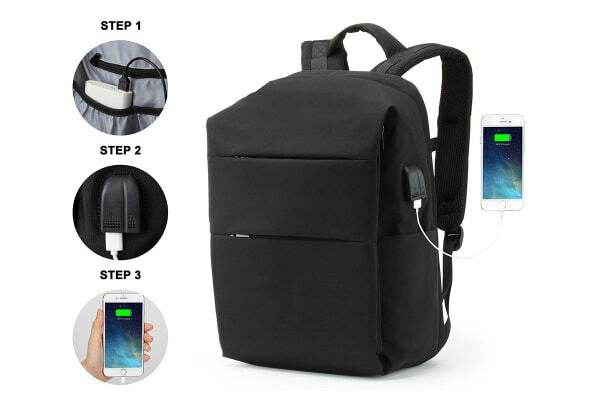 The Anti-Theft Defender Backpack comes with a USB charging port that will help you keep your phone and other devices charged. The strategically located hidden pockets also allow you to easily access credit cards, passports and your phone without having to take off your backpack. Plus, you can even listen to your favourite tunes with the built-in headphone port. Made with strong, durable, water and shock resistant materials, this backpack keeps your valuables protected from the elements on the go. On top of that, its balanced and lightweight design provides all-day comfort.